duchess fare: Pure Style Home's Online Store is Now Open! Pure Style Home's Online Store is Now Open! Northern Virginia based interior designer and blogger Lauren Liess of Pure Style Home now adds textile designer to her resume. After much thought & discussion about how to market her custom collection of fabrics, Lauren has launched her own online shop, selling her fabric by the yard. 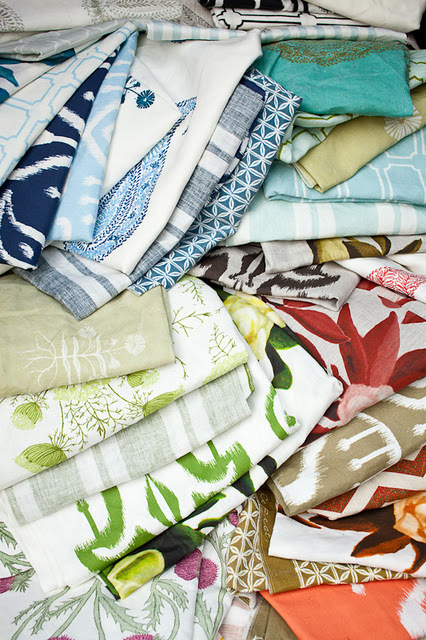 Her line, fittingly titled Lauren Liess Textiles, is offered to both the public and the trade. Shown above, are folded snippets of her fabric all printed with eco-friendly materials on 100% linen. Lauren takes inspiration for her designs from a natural landscape of "weeds & wildflowers". In addition to her textiles available online, Lauren will also be offering Lauren Liess Upholstery, Rugs, and Uncommon Finds, a resource full of interesting home accessories open during select times of the year.